The company expects to release an updated resource estimate on its Mexico project by the end of the year. Goldplay Exploration Ltd. (GPLY:TSX.V; GLYZF:OTCQB) announced additional results from sampling of the historical core drill holes completed in 2010 on the San Marcial Project in Mexico, noting, "The core sampling program continues to successfully identify an attractive, wide, near surface high-grade mineralized zone hosted in hydrothermal breccias close to major geological structures." A 0.5-meter intercept from hole SM-10-06 "returned an excellent result of 2,384 gpt AgEq, within a wider 46.0 meter silver mineralized zone," the company noted. 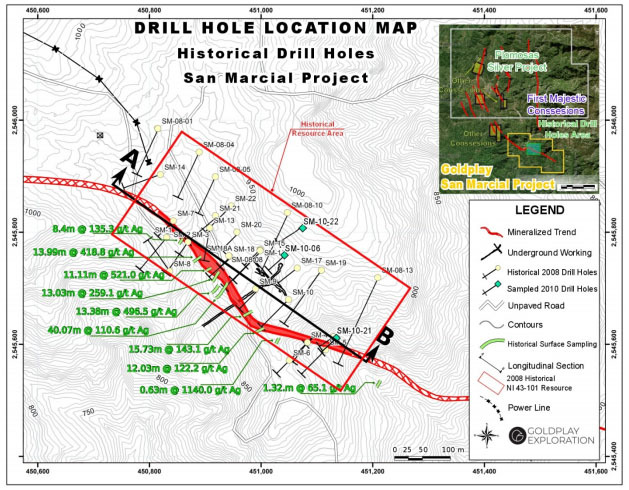 Goldplay President and CEO Marcio Fonseca commented, "Goldplay's systematic sampling of 22 existing core drill holes (previously only partially sampled) is confirming the upside potential for resource expansion, while delineating mineralized zones wide enough to support a high-grade bulk mineable open pit target at the San Marcial Project. The sampling program is progressing with pending results expected to lead to an updated resource estimation by the December quarter of 2018." Sampling of holes SM-10-06 and SM-10-21 confirms continuity of high-grade silver mineralization with anomalous values for lead and zinc. "The mineralization is not only close to major structures but also in a wide and continuous hydrothermal breccia unit," stated the company. "In anticipation of a new resource estimate in the December quarter 2018, the company is advancing the geological/geochemical and structural modelling of the mineralized zones with the objective of defining additional targets for down dip and along strike drilling upon receipt of drilling permits."